This week our nation will pause and honor the memory of Martin Luther King, Jr., a civil rights activist who was assassinated in 1968. 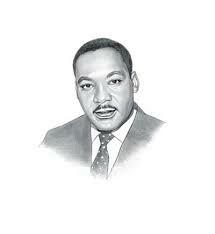 The day commemorates his birthday and remembers his work trying to move the nation closer to a unified racial front. Growing up in the Pacific Northwest, I wasn’t exposed to the prejudices King saw. African Americans were present, but not great in number. I’d only met a few in my short lifetime and those I did know I liked. But the problem became quite visible when my husband and I became friends with a black man who had grown up in the racially charged South. He came by one day to see my husband, who was not home. When invited to wait inside, he declined. Instead, he went to the front step and sat down. I wondered about his reasoning, but then it dawned on me. I was a white woman. Years of conditioning prohibited him from coming into my home, alone with me. Later, we met him for breakfast. One would have thought we walked into the restaurant dressed in Halloween costumes for all of the stares that came our way. I could tell our friend was very uncomfortable. The kind of life he must have lived upset me—always under the scrutiny of whites, forced to be different everywhere he went. A song, Jesus Loves the Little Children, is popular in most Sunday Schools. It teaches that every child is precious in Jesus’ sight, red-skinned, yellow-skinned, black or brown-skinned, as well as white. Jesus saw all of us, the children of the world, as special. He didn’t see color, He only saw the need to love. In the Bible, Matthew 19:14 (NIV) quotes Jesus as saying, “Let the little children come to me, and do not hinder them, for the kingdom of heaven belongs to such as these.” After he instructed his disciples, he called the children to himself and laid his hands on them. Jesus commanded we love. Martin Luther King, Jr. taught it. We should practice it.. That way my black friend, my husband, and I can enjoy life as equals. I’m certain God would approve.